HG "Sep 22 2012", "12:12:16"
The Bausch-Gall Real-Time Library (BG_RT) includes components to access data acquisition (DAQ) cards directly from a Modelica simulator. It was designed to allow the usage of the Dymola Realtime option with DAQ cards without any further programming effort. Currently we support the card NI-USB6009 from National Instruments. Functions for reading and writing analog and digital data are provided. BG_RT allows easy and low cost HiL-simulation. Only a standard Windows PC with Dymola, option Realtime and a DAQ card are needed. The library is delivered with complete source code, including the code of all C-routines. Therefore it can be used as programming template for other DAQ cards. 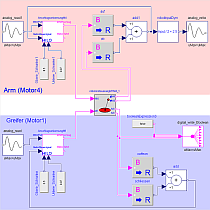 The BG_RT Library is currently available for Dymola 7.4 (Modelica 3.1). A version for SimulationX is planned. We also assist with the adaption of other DAQ cards.